Growing a culinary herb garden provides an abundance of fresh herbs ready for use in your favorite recipes. These easy-to-grow plants thrive in a sunny location and require little care other than pruning and harvesting. Most herbs thrive in poor soil and are drought tolerant, eliminating the need for supplemental fertilizer or water. Choose herbs that you prefer and use on a regular basis. Although some herbs, like sweet basil are annuals and must be planted each year, most are perennials. Once established these hardy plants return each year with renewed vigor. Perennial herbs for beginners include oregano, thyme, chives, lemon balm, sage and mint. Annuals like basil and summer savory are easy-to-grow annuals that provide robust flavor. Starting your herb garden with a selection of perennials establishes a good bed that you can rely on for years. Unless you have a greenhouse or intend to use grow lights in your home, seed starting can be difficult. Many herbs require up to a month to germinate and require a lot of light to grow. Those who live in northern climates are better served to simply buy seedlings from the nursery, as light is insufficient to grow herbs on the windowsill in early spring. Prepare a site in a sunny location that receives at least 6 to 8 hours of sunlight a day. Full sun all day is preferred as herbs develop the oils responsible for their flavor and scent best in full sun. Amend the soil lightly with an inch or two of compost or well-rotted manure to improve drainage and aeration. Fertilizer is not needed for most herbs and may cause lush foliage that lacks flavor and fragrance. Plant individual herbs to the original planting depth and follow the spacing requirements of the specific herb. You can find this information on the plant identification tag that accompanies the plant. Most herbs do not require supplemental water, but if you choose to establish a regular watering schedule, water deeply once a week. Always monitor plants for signs of wilting. Harvest leaves as soon as the plant is 4 to 6 inches high to use to flavor your favorite recipes. Harvest herbs for drying or freezing before the plants bloom for the best flavor. Chop fresh herbs and freeze in a bit of water in ice cube trays. Once frozen, place the cubes in freezer bags and store in the freezer. Use one or two cubes to season soups or sauces. I've been growing herbs for over 20 years. When visitors admire the beauty of delicate creeping lemon thyme or marvel over the fragrance of fresh basil, I brace for the question that allows follows. "But, how do you use them?" They are often perplexed when I explain there is no right and wrong way to use herbs. Using herbs depends on individual taste. 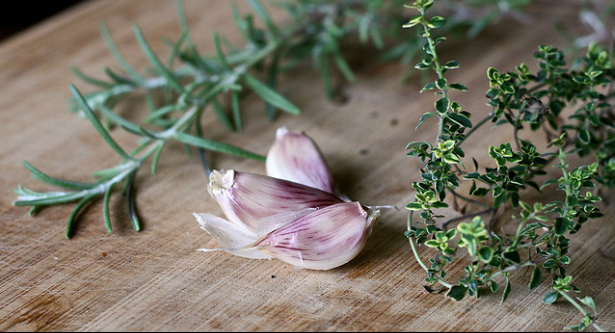 Although there are some basic rules like using oregano, chives and basil for tomato or Italian dishes and sage to provide flavor to meats and poultry; I have discovered that combining herbs creates new and exciting flavors I simply didn't expect. So, go ahead. Experiment. You'll be surprised with what you discover.